avoided and around 1000m (3300ft) if it is included. exposure and length that make this route truly Alpine in character. grade of I and can be soloed with ease. the conditions are dry or with good ice but right if it is under heavy powder. the left hand side before climbing to its apex. 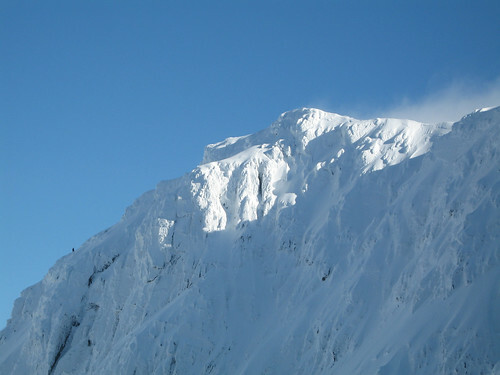 to escape, please be aware of potential avalanche dangers. You may have to repeat several times at this juncture. breakfast & coffee. Wander about looking liking spaced out refugees for a while. More coffee. Set of for a day of high adventure. Little Tower to Great Tower (1 hour). 13:30hrs. (4 & 5 may go quicker). Check pace, time, well being of group and conditions and then consider options. where possible to make up time, walk-in, walk-out, Douglas Gap to Great Tower. hard could it be? What could possibly go wrong? everything double checked and Adrian was off. the belay point. Gear switched hands and it was my turn for pitch two. chimney is quite wide here and would allow for two people to stand side by side. off-width shuffling gained good foot holds that in turn led to a good hand hold. ledge. Gear went in, and I relaxed to contemplate the next bit. per axe. I was able to re-establish my feet and try again and again and again. holds but the rock was smooth underneath. involve a controlled fall. Looking about, it seemed possible to traverse right. seemed the only possible way to make progress. plunged the left axe low and close to my body to use as a push down hand hold. relief and could breathe again. would I, I was committed and focused. fair bit of action. At one point even the handle was employed. On the way I passed more than one piece of in-situ gear left by persons unknown. ahead. Someone had climbed it so it was possible. what was going on, but as I pulled up it seemed to correct itself. A couple of stepped blocks led to a small rubbish snow bank in the corner. found, what felt like, the right sequence. ping as the right axe popped out of its placement. myself and conducted a mental system check of my body. No, nothing obvious hurt. right”? The in-situ nut and my first tri-cam placement had held. fall was 8m to 10m in length or around the height of an average two story house. stopped. My forearms felt like jelly and sweat was running freely down my face. 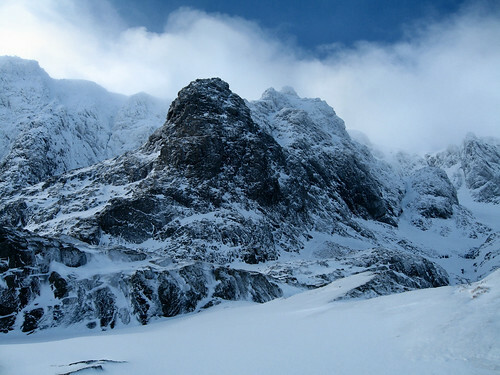 A second system check revealed I had lost my left crampon and my right ice-axe. dryly mentioned seeing items of gear fly over head at great speed. snatched my axe out of my hand during the fall. William Morrison’s for some food and a bottle of single malt. absolutely sure of what is ahead. Fully iced up cracks would have made this route so much easier. If pushing the grade (winter) research the route first. “Andy led most of it, nails for the grade”. Reference to Andy is not me! gear at crux section. Abbed off route”. “Anyone else find this outrageously under-graded”? climbing at is anyone’s guess? belatedly announce themselves to me. sometime between 10:00hrs and 10:30hrs. flank. This started with a small ice pitch and thereafter was consolidated snow. off and was soon near the base of The Great Tower. “fast” party who hadn’t managed to start the Eastern Traverse yet. behind a slow party struggling to get up the Great Tower. felt committing as a second. Good lead Adrian. sanctuary. In the end he managed his escape. God only knows how. the clouds descended and we had to navigate off the plateau the traditional way. to 8 hours to do. back to car park the following morning to collect his car. a stir fry for us which down rather well with some single malt and red wine. extra two hours to our summit time. of achievement was immense. This day will live us with for a long time. Looking across Observatory gully to where the big boys play. Probably it’s the Orion Face where a party are nearing the top. Wilson. K., (2007), Classic Rock, Batan Wicks, London. Daffern, T., (2002), Avalanche Safety, Batan Wicks, London. This entry was posted in Old articles on 04/05/2010 by andyh. This entry was posted in Old articles on 04/12/2009 by andyh. 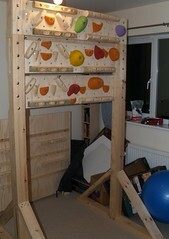 First, what the heck is a woodie and how on earth can it help with climbing? A woodie is best described as a freestanding frame that facilitates a wide range of training techniques. 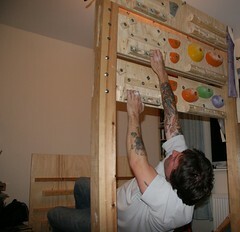 These go beyond pull-ups which many people wrongly assume is a woodie’s primary and only function. It is designed for tendon-friendly muscle-strengthening endurance exercises. These target the fingers, arms and back. It will work these areas in a similar way to as if the climber were on steep rock, and is therefore an ideal training medium if your aspirations are for climbing in this direction. What it will not do is improve your footwork, unfortunately, you’ll still have to go to the rock-gym or, heaven forbid, climb real rock to achieve this. The aim is to build up to being able to complete burns of between 4 to 10 minutes separated by 10 to 15 minute breaks. Depending on how you attack the workout session, you can work your aerobic endurance and/or gradually push your anaerobic threshold further. What this does aerobically is to increase your endurance and thusly increase the time taken before the dreaded anaerobic pump sets in. However by using this device you can hang in there once the pump sets in and see how far you can push it in a fairly safe environment, crash matting is advised. I have commandeered Caroline’s boulder mat for this purpose. Once you start to get a feeling for just how long you can actually “hang-on” once pumped, when you’re on real rock you will see a decrease in the panic / stress that can accompany this sensation. In short, a woodie can be used to develop endurance and strength in the upper body, especially the forearms and fingers. It is not used to develop power. It is free standing, hence no need to rebuild your house (important if you are renting and prefer not incur the wrath of your landlord). 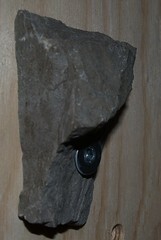 It is relatively cheap; you can keep the cost down by making your own wooden holds. It requires only basic woodworking skills and tools. It can be built well within a single weekend (ideal winter project). It is relatively small so should fit into a spare room. As it is in the house and not a cold garage, you are more likely to actually use it. It is very versatile and can be used for a great many exercises. Two 7-foot 4x4s; kiln dried (if you weigh less than160 pounds these can be reduced to 2x4s). These are used for the vertical supports. A minimum of two pieces of ¾-inch plywood are used for the horizontal cross members. These are sized (minimum) of 8 x 42 inches, mine were longer as I was making a custom version, as opposed to the standard one that is shown in Eric Horst’s book Flash Training. It was this book that inspired me to build my own woodie. Two 48-inch 2×4’s, these are attached to the vertical 4x4s to stabilise the unit. Four 31-inch 2x4s. These are used to support the vertical 4x4s to the bottom stabilising beams. Four 90 degree Teco (or similar) plates to secure the vertical units to the lower stabilising parts (easy) or if you are more skilled use a mortise & tenon joint with two coach bolts per side. 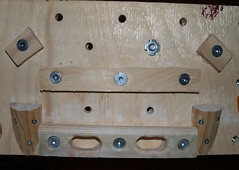 Fixings: approximately 25 3-inch drywall screws (wood-to-wood joins), 25 1.5-inch drywall screws (Teco plate to wood joins) or use coach bolts long enough to run through 4 inches of wood. The woodie could be made narrower to hold just a fingerboard if you’re quite pushed for space. Anyone wanting to make one who would like further advice or assistance, I’m only an email / phone call away. The above book is out of print but is readily available on Amazon, or mine is available for a short term loan. This entry was posted in Old articles on 03/12/2009 by andyh. last bad bit before it turns good”, and it did. activities. We then retired in good style to the pub for some grub. Llanberis pass savouring every last drop of rain. membership made it off the crag in daylight hours. Wow; two days running. holds all in the wrong places, VS 4c, like ‘ell, I would guess HVS – E1, 5b/5c. along with a number of miscellaneous grunts and frowns. language turned blue and, as he described it, I started to use “power grunts”. Joe hadn’t done anything to change his mind. had the injured arm excuse to use, which I did unashamedly. classic’s, The Ramp *** (V1 / font 5) and Ramp Central * (V2 / font 5+). In brief a good weekend with good company and umm, good(?) weather. This entry was posted in Old articles on 02/08/2009 by andyh. After a flurry of emails and texts it was agreed that my partner in rock climbing excellence, or should that be rock terrorism, Mr Rafe, and I would meet at the infamous Dol-gam, Capel Curig campsite. Yes, the famed campsite that comes complete with quadraphonic sheep sound effects (steady Mr Krug) and the dulcet tones of a handy built-in running river. Oh, and not forgetting the farmer who appears smiling at your tent entrance wanting payment at some ungodly hour in the morning. After packing most of my kit the night before with the idea of an early start a self-induced disaster slowly began to overtake all my plans and good intentions! After a series of delays I was successfully ambushed by my World of Warcraft PC game (I only meant to check my emails, honest governor). After a sustained tussle I was able to escape this torrid virtual landscape and re-enter the real world. Oh crikey, fiddle sticks and all that; I was behind schedule and much, much worse Mr Rafe was on my case! He had sent a text message to say he had already arrived at the campsite. I was shocked as he even had the audacity to ask deep and penetrating questions such as what time was I expecting to arrive there. A hasty text, and an even hastier exit, and I was off and running; the car was revving, its stereo cranked up to the max heaving out Scandinavian black metal vibes, and my leaden right foot stomping on the accelerator hard. I didn’t exceed 100mph once, well maybe once but don’t tell anyone. Good progress was made until opportunistic feeder Andy was led astray and, as if by magic, drawn into a midpoint service station for some of their world-class cuisine (not), a suitably large coffee and an even larger bill out of all proportion to the meagre peasant-level fodder produced. Fully caffeinated up I was suitably wired to carry on towards North Wales at breakneck speed. I finally descended on the campsite at 23:30hrs or was it 00:30hrs where Mr Rafe, the hero and scholar that he is, was still awake and able to offer a tin of beer which I felt duty bound to accept so as to honour the rules of hospitality. My God, this was North Wales in October and I able to put my tent up with no rain; had I entered a strange and mysterious alternative Wales? Apparently not – I had missed the rain by a few hours as was evidenced by my now slightly soggy camp shoes. Some discussion was held with talk of an easy first day with an easy (beer talk there) VDiff up on Glyder Fach main face as a warm-up to be followed by something harder. Retiring not soon afterwards we were to be kept awake by lashings of rain in a much more traditional Welsh setting. Alas we ended up rising a bit later than planned; oh well, “best laid plans” and all that. I must stress that the late start was nothing to do with sheep or beer. Every cloud has a silver lining as we opted to use this as the ideal excuse for a trip to the gear shop and a deluxe, super-healthy (? ), heart-attack-inducing fried breakfast. Once again both gear shops were sold out of the items I wanted, although this didn’t in any way hamper the bumper gear fondling session, one shop was even visited twice! After re-lacing my boots and carefully stowing my recently purchased energy bars in Dave’s glove box we were off. We set off from the car park at about 10:30 – 11:00hrs for the hike up to Glyder Fach. We took a fairly direct line of attack yomping up past Milestone Buttress on Tryfan, then contoured off towards our target just before the Bristley Ridge / Bwlch Tryfan area. On route to the Glyder Fach main face area we came across a fantastic looking bouldering area with oodles of crack problems, from finger to hand to full-on off-widths. We may enter the dark side and return here at some point for a dedicated boulder session as this looked like far too much fun to ignore. Gaining a bit more height we were able to cross the scree slopes at their narrowest points; always a disappointment that, as we all know much fun scree slopes can be. We were at the base of the climb by about 12:30ish. It was at this point I now remembered that my energy bars were still in Dave’s glove box, in Dave’s’ car at the blinkered blink blank car park. But Mr Rafe being a total gent offered me some of his grub. Geared up with both ropes flaked we were ready for action! Dave was especially excited as I had managed to coerce him into a first taste of the dark connoisseur art of big boot climbing. Out came the guidebook for a final consultation. The trusty Ogwen and Carneddau tome describes Chasm Route ** (IMC star junkies take note) as an honest old fashioned climb that demands a workmanlike approach and according to its pages it even has a “famous” named crux pitch called “The Vertical Vice”. The new Ground Up North Wales guide even goes as far to make wild claims about The Vertical Vice typically requiring the considerable expenditure of energy and then trying to scare off would-be pundits with mention of a difficult finishing crack once past the terrors of the vice! Things finally got off to a slow start at some unspecified time – we had both tucked our watches away in our rucksacks at the bottom of the climb for safe keeping. We decided to link the first two pitches together for speed although this was negated by Dave having an extremely fun time experimenting with the sublime skill of climbing in big boots. It must be said that his progress was assisted (not) by jocular comments wafting up from the belay stance. What was the hold-up? Why was he taking so long? Ah, now was my chance to show him how it should be done – enter Mr Hansler, devourer of VDiffs. Umm, this seems a bit thin, bold in places, crikey that felt a bit stiff for VDiff I thought to myself feeling a bit humbled. Quickly taking the gear I set off up the pitch that gives the climb its name; a steep and smooth sided beast that is greatly assisted by a crack on the right, the anatomical advantage of long arms and some slightly unorthodox manoeuvring. This was all proving to be great fun. Even more fun was finding some puddles on the ledge right were I wanted to plant my hand as well. The next few pitches went quite smoothly but it was noted that the cloud cover was dropping a bit and it seemed darker than it should be. A quick check and yes, we had both left our head-torches in our rucksacks, obviously to keep our watches company. Dave arrived at the base of the “Vice” pitch and shouted down encouraging words to the effect of “I’m glad that you’re going to be leading that”. I was now ready for whatever this “vice” thing could throw at me; and hah, that didn’t look like much. I squirmed into a narrow greasy chimney, jammed a boot in and wriggled my way up towards a smallish opening through which some daylight was filtering, I then did the rock climbing equivalent of the breast stroke and pulled through into a strange little cave-like affair. Umm, I thought, as I realised the squirmy chimney thing wasn’t actually the “vice” bit of guidebook notoriety. Crouching back down for the second time I unfolded the mental drawing board for a quick re-take; the escape to the right was an obvious cop out so I ruled that out but facing left I could make out a ladder of smooth handholds. Up I went again. This is hard I thought, down I came again. Next, squatting, I lent out at full arm’s-length so I was almost outside the chimney / off-width monster and grabbed a hold with my left hand and heaved upwards in a “workmanlike fashion” and wedged my feet behind me. What followed was a torrid battle using a technique best described as “chest and footing” that included expanding my chest so my upper torso acted as a cammng device. At one point my upper body was cranked round about 100 degrees with respect to the orientation of my legs (one of which was momentarily stuck under an unhelpful flaky bit) as I followed the handholds up and to the right. This was new, I have never been pumped on a VDiff before. But then suddenly whoa, I was free from this menace from the land of Wales and the glory days of tweed climbing. Where did I put my pipe? Hah hah, the final difficult crack was there right in my face; a nice big beast splitting into a Y shape in its upper reaches and yes, it was polished to a very high standard. It looked like someone had really gone to town on it with the Pledge. So right at the best possible moment, as I was halfway up, the rain came down and out came a fair few swear words and up came some laughter from the belay. Wedging in I found a solid chock to pull on with another one conveniently higher and behind. Grabbing the second chock stone I was somewhat alarmed as it suddenly moved towards me and attempted to escape the crack. Luckily my feet were cammed in solidly and I had a bomber right handhold. Heart inserted back into my chest up I went again. Finally at the belay station I was able to relax and collapse into a jellied heap. Dave came thundering up after the belay had been set up but not without some grunting and noises of protest it should be added. Once we were both safe the belay was dismantled at the speed of light and the ropes coiled even faster. Optimistic talk was even bandied about getting to the pub for a decent meal; thoughts of doing Lot’s Groove had long since evaporated in the salivating jaws of The Vertical Vice. Damn, it was getting dark. Off we merrily went to locate the obvious and easy-to-find descent route in the now very poor light. Buggernuts! Someone had stolen it, probably the sheep. At last we found a gully of some description and we carefully started down using the time-honoured fairy step technique. After much tentative blundering about we found a large ledge with some rather decent “ab tat” helpfully attached to a large flake. Looking across I could see where we were, height- wise, in relation to the Chasm Route. A brief consultation with the guidebook confirmed we had enough rope to reach “dry land”. Setting up an abseil point with care I led off into the dark, down what seemed quite a steep face. Once I was clear of the ropes Dave followed. Leaving Dave to sort the ropes I tiptoed across to our base camp skirting around the top alphabet slab. Eventually the sacks were discovered and head torches recovered. 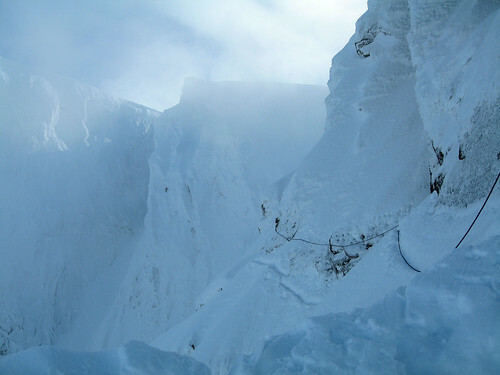 Going back was a bit harder as I could now clearly see the drop off from the traverse, or part of it as it disappeared into the mist. Dave was somewhat relieved to have his head torch back in his possession. The first rope had been pulled through, freed and coiled; however, the other rope wasproving to be a bit more problematical. Much cursing would have been heard if anyone else had been silly enough to be sheep hunting climbing in this area at this late hour. After 30 minutes of trying to free it by various and devious means an executive decision was made to abandon the damn thing. After reclaiming our sacks and de-gearing it was about 20:30 or thereabout and quite dark. Our master plan for navigating out was to go generally right and down, not so easy as it was now darker than a dark thing and the cloud cover / mist had reduced our illuminations’ effectiveness to about 5 – 10 metres. So off we went generally forward and to the right as planned, using the slope as guidance and hoping find Cwm Bochlwyd at some point, and then to locate the path from that. After some careful down-climbing and backtracking, and possibly chasing our own tails we managed to identify a large grassy slope leading us straight down to the even larger boggy expanse in which the lake most be hiding. At last we found the Cwm Bochlwyd from which we were able to take a bearing and find the missing path. Good progress was made until the path vanished, re-appeared and vanished again and again. But now we were on the final leg of the journey. At one point I made a snappy comment (apologies Dave) which in hindsight was good indication that the blood sugar levels were dropping due to a lack of sustenance; sugar, spice and all things nice. After a while and the odd trip we decided to have a break; no point in getting a busted ankle in the last 30 minutes! At last we made it back to the car and wasted no time in raiding the glove box for the energy bars; feeling much revitalised we demoralised ourselves by checking the time – 00:30hrs. With no more to-do we rushed back to the campsite and set to cooking some food and cracking out some beers (cheers again Dave). Of course it decided to start raining but then stopped after we retreated to the safety of the tents. The next day we went to Idwal Slabs for easy day; Tennis Shoe seemed a bit greasy so we opted for The Ordinary Route. We generally followed the line of The Ordinary Route, but climbed the slab to the left on the first pitch and following a more direct line higher up. This time the descent was much more civilised although the gully was a bit wet. And yes, this time we did make it to the pub for some well-deserved beer, and we stuffed ourselves stupid. Damn the temptations of the desert menu. On the final day “Operation Rope Rescue” was launched. The offending rope was recovered without too much fuss and we were able identify our earlier descent path. Off we went to have a look at the Llanberis Boulders, but alas a boulderfest was not destined to occur as the weather finally broke. Saying goodbye and getting back into my car I prepared myself for the highly inspirational journey back to flatland Suffolk. Anyone wanting a good old-fashioned climb should look up Chasm Route; it has a lot to offer; lots of varied climbing and an exciting and bizarre crux. Personally I would give this three stars and the not the guidebook two. But be warned, I’ve climbed VS routes with easier crux moves than this! So this definitely looks like one of those VDiff’s you should breeze once you are leading VS routes on a regular basis. This entry was posted in Old articles on 05/12/2007 by andyh. First off on my hit list of climbs for the 2007 season will be last years failed attempt at un-powered human flight. This tale of woe and misgivings started on a bright and sunny morning during last year’s Yorkshire IMC meet. It all started very well in the morning climbing into new grades for the first time and making a reasonably good job of it. However, (cue the beginnings of the Jaws theme) in the afternoon I spied an interesting climb that looked like “it might go”. This new venture was rather inauspiciously titled Parallel Cracks, which is, surprisingly, two parallel cracks. These can be climbed in tandem or individually. I quickly consulted the guidebook and the grade, VS 4c, leapt out at me, as did the route description for the left hand variant, which stated that the climb “has an interesting finish trying to locate a ‘secret’ hold”. After an easy start things began to increase in the interest department. This wasn’t too foreboding as I managed to get some early good gear placements. But as I gained altitude the gear placements thinned out somewhat. After nearly 10 minutes of faffing I made it to the last section and thankfully some more gear. I really wanted to double protect this bit but the only thing that would have gone in was the cam I had used near the bottom. What followed was a shift layback manoeuvre arriving at a large jug and with arms beginning to tire I pulled up and over fully committing to the move. Now there was no going back, just the sickening feeling of a huge sloper of a finish and the damned secret hold that suddenly went into stealth mode and proved to be much more elusive than I had at first hoped for. Damn; was it left or right? Nothing looked obvious. Decision time, I opted for groping to the right only to find out later that the hold was in fact to the left. Spread out across this dastardly and seemingly featureless typically rounded grit surface I noticed that my hands were (alarmingly) beginning to move backwards very slowly (Jaws theme reaches a crescendo). Despite mentally trying to convince my hands that they were in fact stationary and not moving in an inappropriate direction they continued to move backwards but a bit faster just to rub the point in. I now realised a lob was imminent. Swiftly gaining backwards momentum in what was described “as a very graceful start” by my second I soon peeled away from the rock with all pretence of grace evaporating as I randomly thought about the lone upper piece of gear. So began my arc of descent that included a trip through a nearby tree to collect foliage in my helmet. Talk about value for money; in a matter of seconds I was suspended upside-down four metres from my start point but yes, the gear did hold! Nelsons Nemesis, Horatio’s Horror, Topsail & Powder Monkey Parade (Birchen). North Buttress Arete, Taller Overhang & Portfolio (Windgather). High Neb Buttress, Verandah Buttress, The Right and Left Unconquerables & Paradise Wall (Stanage). Via Dolorosa & Valkyrie (Roaches). Lightning Wall, Finale Groove (Swanage). Haste Not (Multi-pitch Lake District). Dream of White Horses (Gogarth). The File & Surform (Higgar Tor). Machoism & The Great Zawn (Ramshaw Rocks). Now or Never (Burbage North). Via Dolorosa & Valkyrie / Valkyrie Direct (Raven Rock). Some of the above are dream reach goals for next season but to get results you have to have dreams… On another note I am currently on the look-out for a regular climbing partner if there are any takers. This entry was posted in Old articles on 05/05/2007 by andyh.